Every coffee addict needs a favourite mug...and this one is perfect for the job! The quirky design features a gas pump that's making coffee instead -just what they need to start the day! 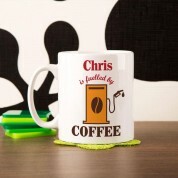 The front of the mug has the "is fuelled by coffee" text and is completed with the recipient's name. 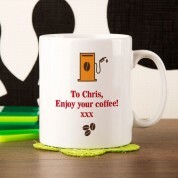 The back has space for your own personal message between the coffee pump and beans. 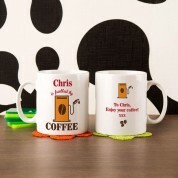 It's a fun and practical gift for a coffee lover's birthday, new job, or any special occasion.